Funerals are not an enjoyable time for anyone. Organising a funeral can be very stressful for all involved. of the day, the food. traditional, a simple buffet is usually the order of the day. day run as smoothly as possible. not look at some of the options listed below? Most catering firms have their own funeral menus already established, these help choosing catering a whole lot easier. Sandwiches - a mixture of traditional white and brown bread sandwiches filled with a variety of meat and vegetarian fillings. Mini rolls - small white and brown bread buns again filled with a range of tasty meat and vegetarian fillings. Open Danish sandwiches - sliced French stick topped with a variety of both meat and vegetarian fillings on top of a slice of iceberg lettuce. Quiche - delicious home-made quiche Lorraine, a favourite with guests of all ages. Sausage rolls - the kids will love these and the adults will be quite fond of them too. Sausage rolls are a traditional buffet food and are a must for any funeral. Pie - whether its steak, mince or cheese and onion, pie is another funeral buffet food that will be a hit with guests of all ages. Cream cakes - chocolate éclairs are popular at funerals, slightly messy but very tasty. Other cream cake options include custard slices and strawberry cream tarts. Scones - everyone loves a jam scone, especially those older guests. Served with cream and butter, you can’t fail but impress. 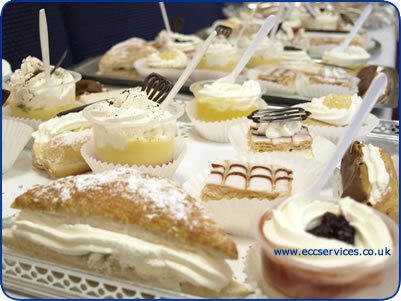 Cake - from chocolate cake to Madeira cake, all types of cake are suitable for a funeral buffet. Remember however it is not a wedding so don’t go overboard. Don’t forget to supply or order liquid refreshments too, most people will be expecting tea and coffee facilities, a few jugs of juice would go down well also. Whatever options you choose for a funeral buffet remember to keep it simple and to try and cater for the needs of all your guests. If you are expecting vegetarians then try and cater for them too, the last thing you want is a big fuss on such an occasion. 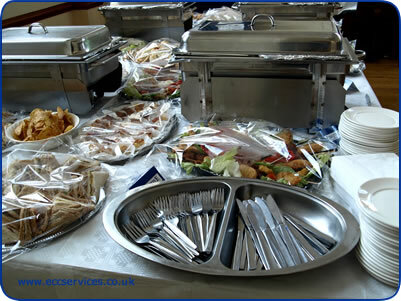 Below are photos from a funeral in Newcastle, we provided a hot and cold buffet. 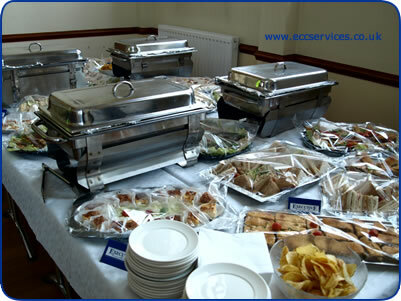 Combining hot and cold buffet items is perfect for winter months, it gives guests a good mixture of food. 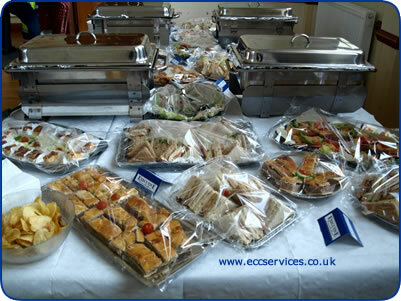 Combining buffet menus is easy simply choose a finger buffet menu or one of our funeral buffet menus and we can supply some of the items hot e.g. pie, sausage rolls and chicken goujons for example. Another hot and cold buffet option would be to choose a cold buffet menu and add a dish from our hot buffet menu e.g chilli, chicken curry or sweet and sour chicken supplied with rice or chips. Adding Cakes and desserts to a funeral menu is optional, our funeral menus come with cakes and desserts included in the price but if you are creating a custom menu you may need to remember to add desserts if you would like them to be provided. 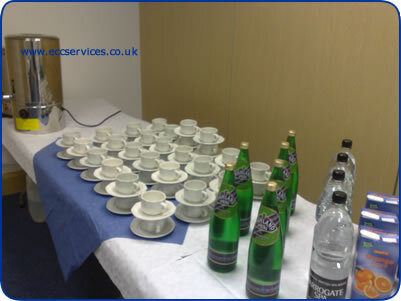 Below is a photo of our tea and coffee service we can provide, alongside the food tea and coffee is a popular choice for guests. For large funerals we would suggest a waitress to help you with the service, please ask about out waitress service if required when calling to discuss your requirements.